Ganyesa is a town of about 19,000 people in the North West province of South Africa. It is located 70 kilometres (40 mi) north-west of Vryburg and about 170 kilometres (110 mi) south-west of the provincial capital Mafikeng. 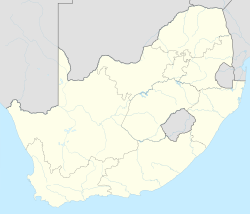 It is an administrative centre for the far north-western area of the province, hosting the head offices of the Kagisano-Molopo Local Municipality, a magistrate's court and various national and provincial government offices. The town falls within the traditional territory of the Batlharo Ba Lotlhware group of the Tswana people, in an area that was formerly part of Bophuthatswana. The census of 2011 recorded the population of the town as 19,290 people, of whom the vast majority were black (98%) and Tswana-speaking (93%). Ganyesa is the main town of the Barolong boo Mariba, a faction of the Barolong that split from the Kuruman community in about 1765 under Kgosi Motsware, and lived as pastoralists and hunters. In the late 19th century, competition with Kora traders for the Kalahari trade led to friction between the communities. After the British established the British Bechuanaland colony in 1886, Ganyesa was designated as a native reserve, with an area that in the late 1950s was estimated at 12,858 square miles (33,300 km2). ^ a b c d e "Main Place Ganyesa". Census 2011. ^ a b "Ganyisa". North West History. Archived from the original on 3 February 2014. Retrieved 31 January 2014.